Flooring « Global Market Insights, Inc. Taking into consideration the regional trends, Utah baghouse filters industry size for the woodworking sector across the furniture & fixture applications will grow at a CAGR of more than 4% over the coming seven years. Rise in infrastructural funding coupled with the escalating popularity of smart & cost-effective furniture in residential and commercial complexes in the region will augment the U.S. baghouse filters market expansion for woodworking industry. U.S. baghouse filters market revenue in California from the architectural woodworking sector is expected to grow notably over the coming years. It is expected to make remarkable contributions toward the overall U.S. baghouse filters industry size for woodworking sector, on account of the rising customer expenditure on renovation activities and interior design. U.S. baghouse filters market share for woodworking segment in Florida is expected to record gains of more than 3.5% over the coming timeline, subject to the elevated presence of lumber producing firms across the region. Texas is also set to contribute more than USD 3.5 million toward U.S. baghouse filters market size for woodworking industry by 2024. Growing customer preference for fashionable furniture is projected to push the regional growth. Pennsylvania industry is expected to make major contributions toward U.S. baghouse filters market share for woodworking industry. Rising awareness regarding the harmful effects of copious amount of dust released during woodworking processes along with modernizations in techniques of wood sawing, milling, and cutting will push the regional growth. Baghouse filters find varied applications in flooring, veneer, cabinetry, architectural woodworking, lumber, industrial woodworking, windows & doors, composite panels, and furniture & fixtures. U.S. baghouse filters industry revenue for the woodworking sector in lumber applications is expected to surpass USD 20 million by 2024, owing to the large presence of saw mills coupled with easy transport access and efficient distribution channels. Cabinetry applications are expected to grow at a CAGR of more than 4% over 2016-2024 and are expected to contribute significantly towards U.S. baghouse filters industry size for woodworking sector over the coming years. Extensive product use in construction and repairing activities will accelerate the growth. 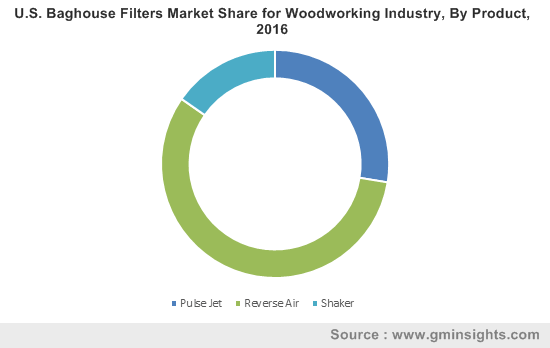 U.S. baghouse filters market for woodworking industry in veneer applications is anticipated to grow at a CAGR of more than 3.5% over the coming seven years. Shaker, pulse jet, and reverse air are the major baghouse filter products. Reverse air baghouse filters are expected to generate more than USD 45 million revenue for U.S. baghouse filters market by 2024. The growth can be ascribed to the product’s ability to effectively carry out operations under intensive heat. Pulse jet baghouse filters will contribute a revenue of more than USD 25 million toward U.S. baghouse filters market for woodworking industry by 2024. Wide product application across furniture manufacturing and veneer sectors are expected to boost the growth. Design and operational excellence of shaker baghouse filters are expected to contribute toward the overall market share. Market players will try to enhance their ROI through product differentiation, new product development, and technological innovations. Clarcor Industries, Amerair Industries Incorporation, Griffin Filters, Aircon Corporation, Donaldson Company Incorporation, Airex Industries Incorporation, FLSmidth Incorporation, Nederman MikroPul GmbH, Imperial systems Incorporation, SLY Incorporation, U.S. Air Filtration Incorporation, Staclean Diffuser Company, Camcorp Incorporation, Mac Process, and Scientific Dust Collectors are the key participants of U.S. baghouse filters industry. This entry was posted in HVAC and Construction and tagged Architectural Woodworking, Baghouse Filter Market, Cabinetry, Composite Panel, Fixture, Flooring, Furniture, Industrial Woodworking, Lumber, Pulse Jet, Reverse Air, Shaker, U.S. Baghouse Filters Market, U.S. Baghouse Filters Market for Woodworking Industry, Veneer, Woodworking Industry.